There comes a time in the life of every Land Rover owner when he thinks about his children. Specifically, he thinks: "What's a more reliable way to get my children to school: Drive them in my Land Rover? Or let them carpool with a heroin addict?" And for the first 18 months I owned my Land Rover, I would've said this was an excellent question. After all: while the heroin addict may show up late and try to pawn your daughter's contact lenses, the Land Rover will occasionally lock your children inside with no warning, and their only food and water will be whatever drips down from the headliner. So both choices are really bad, and if you're faced with this situation, you might wonder if you are living out your own personal version of the 2000 presidential election. But then something happened to change my point of view. Namely, my Range Rover became reliable. That's right, folks: for the last five months, I haven't had a single problem. One hundred and seventy-eight days without an issue. Almost half a year without so much as a single unwelcome noise coming from this thing. It got to the point where I was pulling up in traffic next to Land Cruisers, rolling down my window, and thumbing my nose before tearing off in a flash of perfectly working British auto parts. But then, as I was walking up to the car last week, I noticed it. You would've noticed it, too, if you followed me on Twitter. That's because I posted a picture that clearly showed the problem: it was sagging. And I don't mean merely sagging. The thing was listing to one side like a Russian trawler coming back from restricted fishing waters. Right then, I knew my warranty costs were about to surpass a used Honda. For those of you who have no idea what I'm talking about, allow me to provide a little background. You see, approximately two years ago, I purchased a 2006 Range Rover – the IKEA bookcase of automotive build quality – from nationwide automotive retailer CarMax (Motto: "Got a pulse? We'll finance you."). During the transaction, I learned that CarMax offers a bumper-to-bumper warranty on every single car they sell, so I did the obvious: I paid $3,899 extra for six years and 67,000 miles of full coverage. And I've slept great ever since. So I called up the Land Rover dealer, I scheduled an appointment to come in, and I dropped off my car a few days later. And then ... TERROR! My Land Rover dealer called and told me that the part wasn't covered, CarMax was denying my warranty claim, and I would be out of pocket more than $1,700 to replace my driver's side air spring. Now, at this point, I'm going to diverge from my CarMax piece here for a second and tell you a little something about Land Rover dealers. For those of you who aren't aware, Land Rover service department customer satisfaction ratings are pretty bad. Not just pretty bad, actually: they're the absolute worst in the entire luxury car industry. So awful that J.D. Power satisfaction scores place Land Rover further from the second-worst brand­ than the second-worst brand is from the best brand. Land Rover dealers are so horrible that I get the sense, after dealing with them, that I might have a better experience if they outsourced my entire service visit to a country where goats outnumber automobiles. To illustrate my point, allow me to describe several things that happened during this one single service visit to the Land Rover dealer. 1. I was promised a "branded loaner car," described by the technician as a "Jaguar or something," and confirmed by the Enterprise guy to be "at least or a BMW or a Volvo." With no explanation, I was instead given a two-year-old Chevy Cruze that smelled like the previous renter was a large human groin with a driver's license. 2. The dealer told me to "hurry in Thursday morning" so the car could be looked at right away. Now, I realize I'm known here on Jalopnik as the guy who sits around all day with no pants, but the truth is I have lots of clients and I work long hours, so this was a huge stretch for me. Still, I hurried in on Thursday morning, dropped off the car, and waited. And waited. And waited. And at 4:30 p.m. on Thursday, the service writer called and informed me he didn't have time to look at the car all day. "But definitely tomorrow," he assured me. 3. The dealer tried to sell me the "82,500 mile service" ($286.00 plus tax), until I patiently informed them that I had completed this service three months earlier at a different Land Rover dealer, and the record is undoubtedly in their computer system. 4. The dealer recorded my mileage as 87,000, rather than the correct 84,000, which will result in a "mileage inconsistency" showing up on Carfax. 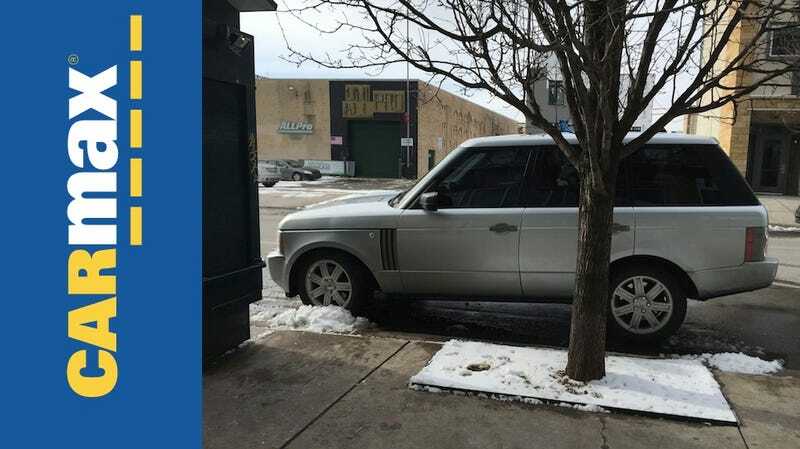 This would bother me more if the car would be worth anything when I go to sell it, but – given that it's a used Land Rover – we all know that it will be approximately as valuable as a Sharpie three-pack. Anyway: the point I'm trying to make here is that the dealer hadn't exactly demonstrated a high-quality operation throughout this process. In fact, the dealer had demonstrated the sort of operation I've come to associate with Comcast, and I was starting to wonder if their next call would be to inform me that my car would be ready "sometime in February, between the 2nd and the 6th." So as you can imagine, I was a little skeptical when they told me that CarMax "refused to cover" the part – especially since the very same part had been covered when my passenger-side air suspension failed back in May. So I did what any disappointed consumer would do: I called the warranty claims department over at CarMax. Well, as you can probably guess, it turns out that the dealer gave CarMax the wrong part number. When the issue was corrected, the dealer (mind you, the same people who believe a Jaguar is equivalent to a Chevy Cruze) vehemently blamed CarMax, and vice versa. But regardless of fault, my repair was covered in full, to the tune of $1,399.36: over $1,000 for the part, plus three hours of labor at $125 per hour. And so goes another chapter in the long, exciting saga of owning a CarMax warranty for a vehicle that offers roughly the same durability as tissue paper. For those of you eagerly keeping track of my CarMax columns, we can draw three important lessons from this experience. Number one: as it turns out, CarMax doesn't just blindly approve my repairs because I'm "the guy on Jalopnik writing about CarMax." Honestly, this surprised me. I thought by now I'd be flagged in the system. I thought there would be a note attached to my file that says: "APPROVE EVERYTHING THIS GUY ASKS FOR, INCLUDING MINOR OFFICE SUPPLIES." I kind of figured I could call them up, tell them my kitchen garbage disposal was broken, and they'd send someone out to fix it, lest they risk bad press. But it turns out CarMax is an honest, responsible company, which is a shame because my garbage disposal is making funny noises. Number two: CarMax has now paid out a grand total of $6,149.03 for my vehicle – or $2,250.03 more than the warranty cost to buy. And I still have 46 months (nearly four years) or 41,000 miles of sweet warranty still remaining. And most importantly, lesson number three: you can never trust anything the Land Rover service department says. Unless, of course, they tell you "it's going to be expensive."